One morning in the early 1930s, James Irving of the village of Dalby on the Isle of Man was getting ready to open his daily newspaper when a high-pitched disembodied voice called out impatiently, “Read it out, you fat-headed gnome!” The voice didn’t belong to Irving’s wife Margaret or his teenage daughter Voirrey—the only humans likely to be in the remote farmhouse—but though Irving may have been offended, he wasn’t surprised. He knew the voice belonged to a strange creature called Gef, who, for some time, had been living, largely unseen, in his family’s home. The mysterious creature first showed up in the Irving residence sometime in 1931, and, according to the accounts of James, Margaret, and Voirrey, initially lived in the walls and, not yet able to speak, imitated a range of animal noises. Quickly, the unseen entity started to pick up human language from the Irvings, and, before long, introduced itself to the family: His name, he said, was “Gef” (pronounced “Jeff”), and he was a mongoose from India. Over the course of the 1930s, Gef The Talking Mongoose became something of a media phenomenon. He appeared in numerous tabloid newspaper stories, and was investigated by paranormal researchers. Though many visitors wrote off Gef (occasionally spelled "Geoff" and "Jef") as some kind of hoax or mass hallucination, the Irving family insisted he was real. They told stories of Gef sleeping in Voirrey’s room, eating bacon and sausages, and even riding the bus and bringing back gossip about the neighbors. 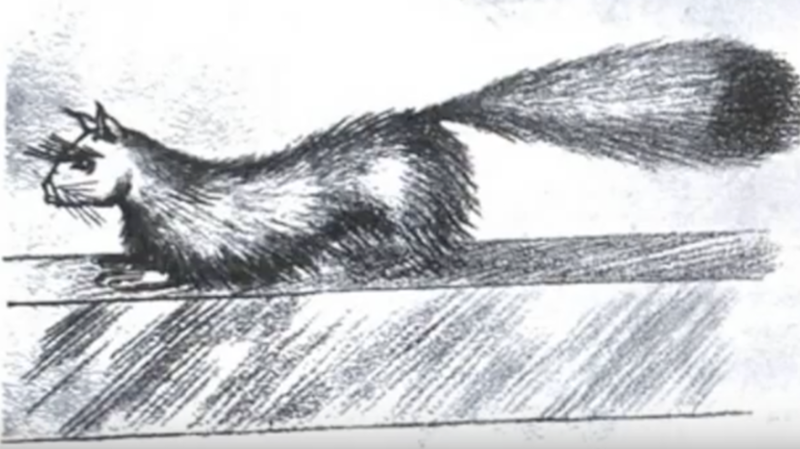 The family members all claimed to have seen Gef at some point with their own eyes, and in a 1932 interview with the Manchester Daily Dispatch, James described the creature as “a little animal resembling a stoat, a ferret, or a weasel, yellow in colour with a body about nine inches long. Its long bushy tail is speckled with black” [PDF]. They accused Gef of throwing stones, killing rabbits, and singing bawdy renditions of "Home on the Range." The talking mongoose’s little speeches, meanwhile, veered from rude (“I have been to nicer homes than this. Carpets, piano, satin covers on polished tables. I am going back there. Hahaha!”) to terrifying (“I could kill you all, but I won’t”). Though only one newspaper claimed to have actually seen Gef—in an article called "'Man-Weasel' Mystery Grips Island: Queerest Beast talks to 'Daily Dispatch' reporter"—some members of the media took the case seriously enough to launch a full investigation. Rex Lambert, founding editor of The BBC’s Listener magazine took on the mongoose mystery with celebrity paranormal investigator Harry Price, and the two published their findings in a book called The Haunting of Cashen’s Gap: A Modern ‘Miracle' Investigated (1936). Lambert and Price emerged from their investigation skeptical of Gef’s existence. Hair samples allegedly plucked from Gef were analyzed, and determined to belong to a “longish-haired dog.” Clay imprints of Gef’s paws, meanwhile, lacked the irregular texture of an animal’s skin, and zoological experts suggested they were probably carved with a stick. Price speculated that Voirrey could have been using ventriloquism to create Gef’s voice. Though the case could’ve ended there, it didn’t. Over the years Gef has faded away, but has never been fully forgotten. First, Lambert (who is probably best remembered for his incorrect predictions about the future of television, including, “Television won’t matter in your lifetime or mine”) nearly lost his job when retired colonel Sir Cecil Levita alleged that his coverage of the Gef story meant he was “off his head.” Lambert responded to the allegation by bringing a slander suit—referred to as "The Mongoose Case"—against Levita, which he eventually won. Maybe the legend of Gef the Talking Mongoose was a collective fantasy, the product of a basic human desire for other-wordly wonder and magic. But then again, maybe Gef really was what he claimed to be: an extra, extra clever mongoose.